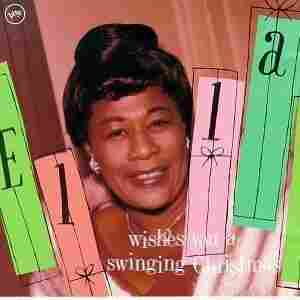 Ella Fitzgerald: 'Wishes You a Swinging Christmas' In 1960, "the first lady of song," Ella Fitzgerald, recorded the album that Murray Horwitz calls "his favorite Ella Fitzgerald performance of all time." Wishes You a Swinging Christmas includes classic holiday pieces by Irving Berlin and Mitchell Parish. A.B. SPELLMAN, National Endowment for the Arts: "Let It Snow, Let It Snow, Let It Snow," Ella Fitzgerald. Ella is a very distinctive stylist. MURRAY HORWITZ, American Film Institute: She is, and she's somehow managed to choose, or have chosen for her, songs on this Christmas CD that really illustrate that. I mean, you don't hear any Christmas carols. You don't really hear any sort of spiritual, religious statements here. What you do hear are the great American popular Christmas songs by the great American popular songwriters — Irving Berlin and Leroy Anderson and Mitchell Parish, the people who wrote songs like "Star Dust" and "Alexander's Ragtime Band." SPELLMAN: Well, Christmas is a time of several moods. It's a time of a celebration of winter, for example, if one can sanely celebrate winter. And that's usually done with the swinging tunes of this record. But it's also a time of very reflective music, and in fact, sometimes of sad, longing music. How about this, "What Are You Doing New Years Eve?" HORWITZ: Well, you've touched a nerve, A.B. It's one of my favorite Ella Fitzgerald performances of all time. And the sad fact is you only hear it once a year. You only hear it around New Year's Eve. It's an underrated song and a very underrated performance. HORWITZ: I will confess, A.B., that there are some sort of corny moments on the CD. But it's Christmas, you know. Christmas is a little corny, after all. Right? HORWTIZ: You think of an office party, people drinking punch, or something like that. That's sort of what this record is like. What saves it from being truly corny is the fact that it swings all the time, and Ella, herself. I mean, she's just got that great sound. To me, her voice defines what America sounds like. SPELLMAN: That was "The Christmas Song," from Ella Fitzgerald's Wishes You A Swinging Christmas. You'll find it on the Verve label. And we suggest that you add it to your NPR Basic Jazz Record Library. For NPR Jazz, I'm A.B. Spellman. HORWITZ: And, I'm Murray Horwitz. SPELLMAN & HORWITZ: Merry Christmas! !